Nanotechnology is a fast-growing area, involving the fabrication and use of nano-sized materials and devices. Various nanocomposite materials play a number of important roles in modern science and technology. Magnetic and fluorescent inorganic nanoparticles are of particular importance due to their broad range of potential applications. It is expected that the combination of magnetic and fluorescent properties in one nanocomposite would enable the engineering of unique multifunctional nanoscale devices, which could be manipulated using external magnetic fields. The aim of this review is to present an overview of bimodal “two-in-one” magnetic-fluorescent nanocomposite materials which combine both magnetic and fluorescent properties in one entity, in particular those with potential applications in biotechnology and nanomedicine. There is a great necessity for the development of these multifunctional nanocomposites, but there are some difficulties and challenges to overcome in their fabrication such as quenching of the fluorescent entity by the magnetic core. Fluorescent-magnetic nanocomposites include a variety of materials including silica-based, dye-functionalised magnetic nanoparticles and quantum dots-magnetic nanoparticle composites. The classification and main synthesis strategies, along with approaches for the fabrication of fluorescent-magnetic nanocomposites, are considered. The current and potential biomedical uses, including biological imaging, cell tracking, magnetic bioseparation, nanomedicine and bio- and chemo-sensoring, of magnetic-fluorescent nanocomposites are also discussed. The term “nanotechnology” is traditionally used to describe materials with a size <100 nm and is an ever-growing and interesting research field to be a part of. Although the “nano” prefix has been used to provide a new host of buzzwords, chemists have been dealing in the nanoscale since the first chemical synthesis. In practise, nanotechnology combines chemistry, materials science, engineering and physics to provide new materials which have potential applications in biology, medicine, information technology and environmental science. Recent advances in nanoscience have allowed researchers to apply revolutionary new approaches in their research at molecular and biological cellular levels, thereby advancing the understanding of processes in a host of areas which up to now had not been possible to study, in particular nano-bio-technology [1, 2]. Because their properties differ from those of their bulk counterparts, nanoparticles offer a range of potential applications based on their unique characteristics. In particular, magnetic nanomaterials represent one of the most exciting prospects in current nanotechnology. External magnetic fields could bring particles which have been injected into the body to a site of interest, thereby acting as site-specific drug delivery vehicles. Magnetic nanoparticles may be used as contrast agents in magnetic resonance imaging (MRI). Magnetic nanoparticles can also heat up once subjected to an external magnetic AC field, which opens up possibilities in hyperthermic cancer treatment. The area of magnetic nanoparticles is therefore not only enticing in terms of applications, but it also represents an exciting and fast growing field. Magnetic iron oxide-based nanoparticles, such as magnetite (Fe3O4), maghemite (γ-Fe2O3) and cobalt ferrite (CoFe2O4), are the members of the ferrite family. Ferrimagnetic oxides exist as ionic compounds, consisting of arrays of positively charged iron ions and negatively charged oxide ions. Ferrites adopt a spinel structure based on a cubic close packed array of oxide ions. If magnetic particles are of very small sizes (of the order of 10 nm) they can demonstrate superparamagnetic behaviour . Superparamagnetic particles consist of a single magnetic domain where the particle is in a state of uniform magnetisation at any field. Superparamagnetism arises as a result of magnetic anisotropy, i.e. the spins are aligned along a preferred crystallographic direction. If the sample is made up of smaller particles, the total magnetisation decreases with decreasing particle size . It is clear that the nanoparticle size plays an important role in determining the magnetic response of the material and hence heavily influences its biomedical activity. There has been much recent work on the fabrication of monodisperse nano-sized magnetic materials (Fig. 1a, b) and this has been the focus of several reviews [4–6]. One of the attractive possibilities of magnetic nanoparticles is the fact that they can be relatively easily functionalised with molecules which may bestow new properties on the particles. These include drug molecules, fluorescent compounds and various hydrophobic and hydrophilic coatings. The focus of this review is the association of magnetic and fluorescent entities. Fluorescent dye molecules are most commonly used for biological staining and labelling. There are many examples of organic dyes used in biology in the literature, for example, DAPI, Mitotracker and Hoescht dyes are used to label cellular features. Another family of nanomaterials receiving considerable attention over the last number of years is the quantum dots (QDs) (Fig. 1c). These fluorescent semiconductor (e.g. II–VI) nanocrystals have a strong characteristic spectral emission, which is tuneable to a desired energy by selecting variable particle size, size distribution and composition of the nanocrystals. QDs have attracted enormous interest due to their unique photophysical properties and range of potential applications in photonics and biochemistry [9, 10]. With advances in current organic and bioorganic synthetic chemistry, capping group formation and bioconjugation strategies, QDs are becoming more widely used as biological imaging agents [9, 11–13]. QDs can be treated with drug moieties, for example, non-steroidal anti-inflammatory drugs, in order to specifically target certain organs or cell organelles . One of the attractive properties of QDs is the fact that their emission spectra may be tuned by varying the primary particle size or composition. QDs which emit at several different wavelengths can be excited with a single wavelength and are suitable for the multiplex detection of a number of different targets in a single experiment . QDs also have advantages over commercially available dyes in that they are less likely to be bleached due to their high photochemical stability . As we can see, both magnetic and fluorescent inorganic nanoparticles have been shown to play a significant role in nanotechnology. Just looking at the wealth of possible applications open to magnetic and fluorescent materials, it is not hard to see why the combination of these two entities opens up the opportunity to provide new nanocomposites which could act as multi-targeting, multi-functional and multi-treating tools. It is expected that the combination of magnetic and fluorescent properties in one nanocomposite would open up great prospects both in nano- and bio-technology, enabling the engineering of unique targeted, nanoscale photonic devices which could be manipulated using an external magnetic field. Here, we hope to demonstrate the importance of these new bimodal “two-in-one” magnetic-fluorescent nanocomposite materials and explore their preparation and potential applications as biomedical agents. As discussed above, both magnetic and fluorescent nanoparticles are of great scientific and technological importance. The combination of a magnetic and a fluorescent entity may provide a new two-in-one multi-functional nanomaterials with a broad range of potential applications. 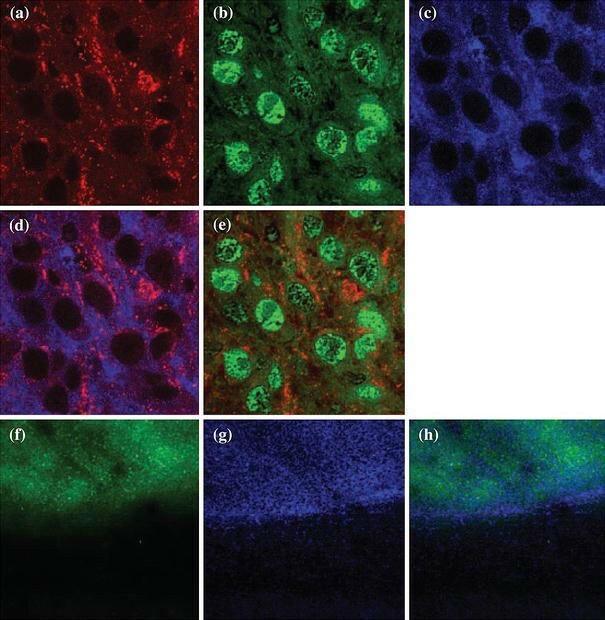 First of all, multi-modal magnetic-fluorescent assays would be very beneficial for in vitro- and in vivo-bioimaging applications such as MRI and fluorescence microscopy. Second of all, these nanocomposites can be utilised as agents in nanomedicine. For example, one of their most promising applications is a bimodal anticancer therapy, encompassing photodynamic and hyperthermic capabilities. Fluorescent-magnetic nanocomposites can also serve as an all-in-one diagnostic and therapeutic tool, which could be used, for example, to visualise and simultaneously treat various diseases. Another exciting application of magnetic-fluorescent nanocomposites is in cell tracking, cytometry and magnetic separation, which could be easily controlled and monitored using fluorescent microscopy. Finally, these nanocomposites can be used as nano-blocks to build various nanoelectronic and photonic devices by applying an external magnetic field to manipulate or arrange the magnetic nanoparticles and using fluorescence confocal microscopy to visualise and control their positioning. Thus magnetic-fluorescent nanocomposites are very promising materials, but there are some challenges to overcome in their fabrication. One of the main obvious problems is the complexity in the preparation of these nanocomposites, which frequently involves a multi-step synthesis and many purification stages. Therefore, the production of magnetic-fluorescent nanocomposites is quite technically and time demanding. A specific difficulty in the preparation of two-in-one magnetic fluorescent nanocomposites is the risk of quenching of the fluorophore on the surface of the particle by the magnetic core. In addition, if there are a number of fluorescent molecules attached to the surface of the particle, they may act to quench each other. For example, quenching due to the interaction of the fluorescent dye Cy5.5 and the iron oxide nanoparticle to which is was attached as been reported . Inter-molecule quenching has also been explored, with a lower number of Cy5.5 molecules per particle showing higher fluorescence intensity than particles prepared with a higher loading. In this work, the authors have noted the efficient quenching ability of colloidal materials; in particular, colloidal gold has been shown to quench fluorophores ranging from fluorescein to Cy5.5. Non-radiative transfer has been blamed for the quenching of fluorescent molecules when attached to both magnetic and gold nanoparticles . The fluorescence intensity of magnetic-fluorescent nanocomposites using fluorescein and rhodamine has found to be 3.5 and 2 times lower than the dyes alone, respectively . This quenching process is believed to occur because of fluorophore contact with the metal oxide particle surface, resulting in an energy transfer process. Similar behaviour has been reported by Mandal et al  who carried out the emulsification in water of an oil-containing oleic acid stabilised iron oxide particles and tri-n-octylphosphine stabilised QDs. A decrease in the fluorescence intensity of the synthesised droplets was noted. Variation of the iron oxide content from 0 to 51% (C max) caused a decrease in the fluorescence intensity by a factor of 100. At higher iron oxide concentrations, the authors attribute the quenching of the QDs to static and dynamic fluorescence quenching of the dots and to the strong absorption of the transmitted light by the iron oxide particles. The problem of quenching can be partially resolved by providing the magnetic nanoparticle with a stable shell prior to the introduction of the fluorescent molecule, or by first treating the fluorophore with an appropriate spacer. We will discuss in detail the synthesis approaches which may be used to provide magnetic-fluorescent nanocomposites and the routes taken to ensure quenching events are minimised. Finally there are typical problems related to instability and aggregation of the nanocomposites in solutions. The aggregation can be caused by magnetic, electrostatic or chemical interactions between particles. Therefore, a careful design and an extremely accurate synthesis methodology are required for the development of the fluorescent-magnetic nanocomposites to avoid their aggregation and precipitation. The area of fluorescent-magnetic nanocomposites is still very much in its developing stage, making the classification of these materials difficult and quite arbitrary. Most of these nanocomposites are core-shell nanostructures. In general, we can identify eight main types of fluorescent-magnetic nanocomposites (Fig. 2): (i) a magnetic core coated with a silica shell containing fluorescent components; (ii) polymer-coated magnetic nanoparticles functionalised with a fluorescent moiety; (iii) ionic aggregates consisting of a magnetic core and fluorescent ionic compounds; (iv) fluorescently labelled bilipid-coated magnetic nanoparticles; (v) a magnetic core covalently bound to a fluorescent entity via a spacer; (vi) a magnetic core directly coated with a semiconducting shell; (vii) magnetically doped QDs and (viii) nanocomposites, which consist from magnetic nanoparticles and QDs encapsulated within a polymer or silica matrix. This classification is mainly based on the structure and synthesis strategies for these materials. There are several reasons for choosing silica as a coating for magnetic particles in the fabrication of fluorescent-magnetic nanocomposites. First of all, the silica coating provides an effective barrier to quenching of any fluorophores by the magnetic cores. In fact quenching can be controlled by the thickness of the silica shell. Second of all, the silica shell is relatively inert and optically transparent allowing incorporation of fluorescent dyes or QDs directly into the shell. Thirdly, the silica surface can be easily functionalised, enabling chemical bonding of various fluorescent and biological species to the surface. Another important aspect is that the silica coating may reduce any potential toxic effects of the bare nanoparticles. It also helps to prevent particle aggregation and increase their stability in solution. Because the isoelectric point of magnetite is at pH 7, it is necessary to further coat the particles in order to make them stable in the pH region 6–10. Application of a thin layer of silica lowers this isoelectric point to approximately pH 3, which increases the stability near neutral pH . Finally silica coating has a significant advantage over traditional surfactant coating such as lauric acid and oleic acid because there is no risk of desorbtion of the strongly covalently bound silica shells. There are a number of reports on the preparation of fluorescent-magnetic nanocomposites using a silica-coating approach. A general description is given in Fig. 3. Lu et al. have prepared a silica encapsulated commercial ferrofluid (EMG 304, Ferrofluids) and have controlled the thickness of the silica shell between 2 and 100 nm by changing the concentration of the TEOS precursor. The authors have found that the particle monodispersity can be influenced by increasing the thickness of the silica coating. The number of magnetic nanoparticles per shell can also be controlled, with an increase in monomers noted with decreasing iron oxide concentration. By incorporating dyes such as 7-(dimethylamino)-4-methylcoumarin-3-isothiocyanate and tetramethylrhodamine-5-isothiocyanate into the silica shell, magnetic-fluorescent nanocomposite materials have been prepared. The organic dyes are incorporated during the coating process—in effect, the dye is trapped in the silica shell. The isothiocyanate functionality present on the dye moieties has been coupled to 3-aminopropyltriethoxysilane, which can be subsequently co-hydrolysed in the presence of TEOS during the formation of the silica shell coating the magnetic cores. Fluorescence optical microscopy confirms the fluorescent properties of the dyes are not compromised. These composite materials can then be aligned using an external magnetic field. A similar treatment has been employed with cobalt ferrite nanoparticles. These particles were first coated with a rhodamine B iosothiocyanate incorporated silica shell, followed by a layer of biocompatible polyethylene glycol . In order to produce a nanoclinic device capable of specific recognition and cancer treatment, Levy et al. have used a sol–gel approach to coat maghemite nanoparticles with the silica shell, which also enables the incorporation of a two-photon dye. The dye, (1-methyl-4-(E)-2-(4-[methyl(2-sulfanylethyl)-amino]phenyl)-1-ethenyl)pyridinium iodide or ASPI), was encapsulated in the silica shell surrounding the magnetic core. Use of these composites in cancer treatment is considered in Sect. “Biomedical Applications”. A similar synthetic approach has been used by Lin et al. who have initially prepared silica-coated magnetite nanoparticles, before adding organic dyes, TEOS and a cetyltrimethylammonium bromide (CTAB) stabiliser to provide mesoporous silica nanoparticles. Hyeon and co-workers  have prepared monodisperse oleic acid stabilised magnetite nanoparticles and CdSe/ZnS QDs which were then simultaneously embedded in mesoporous silica spheres. The 12-nm magnetite nanoparticles have been transferred into water by subsequent treatment with the above-mentioned CTAB stabiliser, which also enabled the formation of the silica spheres. The average size of these silica spheres was 150 nm. Magnetisation measurements revealed that the superparamagnetic behaviour of the particles was maintained by embedding in the silica spheres. 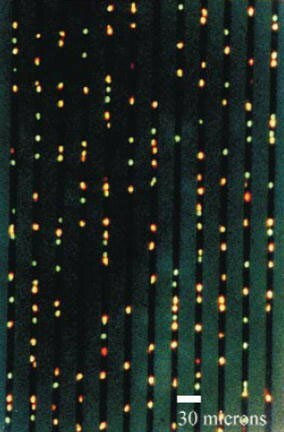 The embedded QDs exhibited a slight red shift in their emission spectra. The surface of silica-coated magnetite nanoparticles has also been coated with CdTe QDs by using a metal ion-driven deposition technique . Here, Cd2+ ions, in the form of CdCl2, are added to a stirred suspension of silica-coated magnetite nanoparticles and TGA-stabilised CdTe QDs. This results in the deposition of Cd2+ ions on the surface of the magnetite, which promotes the coaggregation of CdTe QDs. The Cd2+ may act in two ways to attach the QDs: (1) the ions may couple to surface Te atoms with dangling bonds and complex with any residue-free TGA to form thicker ligand shells; (2) the COO− ions of the TGA surface ligands may electrostatically interact with the Cd2+ ions. 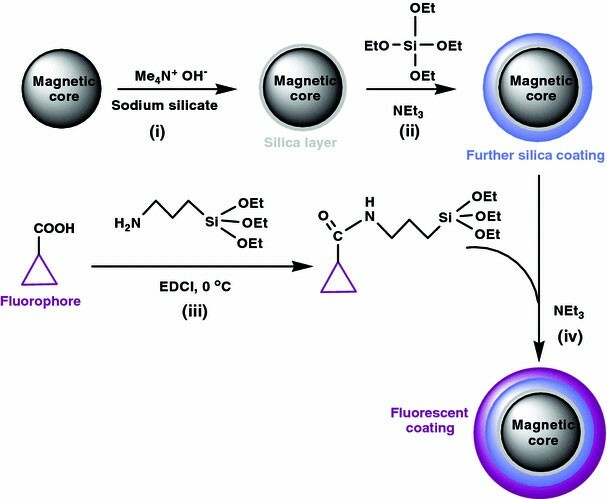 Interesting luminescent and paramagnetic hybrid silica nanoparticles with a magnetic layer have been reported by Rieter et al. . In this case, a ruthenium complex is incorporated within a silica nanoparticle that acts as the luminescent core, while the paramagnetic component is provided by a monolayer coating of different silylated Gd complexes. These particles were prepared by a water-in-oil reverse microemulsion procedure from [Ru(bpy)3Cl2 and TEOS by adding ammonia. In order to enhance the Gd3+ loading capacity, mono- and bis-silylated Gd complexes were synthesised and loaded onto the Ru complex-silica cores. The particle size increases from 37 to 40 nm on going from the mono to bis moieties. This is due to the ability of the bis-silylated Gd complex to form multilayers on the silica nanoparticle surface. Up-converting fluorescent magnetic nanoparticles with covalently bound streptavidin have been synthesised using ytterbium and erbium co-doped sodium yttrium fluoride (NaYF4:Yb, Er), which was deposited on iron oxide nanoparticles by the co-precipitation of the rare-earth metal salts in the presence of a chelator, EDTA . The magnetic-fluorescent nanoparticles were coated with a layer of silica, before being covalently coupled to streptavidin (Fig. 4). These are core-shell nanoparticles with a silica coating of 20–30 nm, containing up-converting phosphors, which emit up-conversion fluorescence at 539 and 658 nm when excited with a 980-nm laser. The hybrid particles were also found to stack in chain-like assemblies when subjected to an external magnetic field. Protein arrays were used to confirm the successful binding of streptavidin, and demonstrate one of the possible applications of the multi-functional nanoparticles at the same time. Enhanced luminescent behaviour of Ln ions (Ln = Eu, Tb) bound to silica-coated magnetic nanoparticles has been reported by Hur and co-workers . This increase is attributed to an efficient ligand-to-metal energy transfer. The lanthanide ions have been bound to the silica-coated particles by reaction with 2, 2′-bipyridine-4, 4′-dicarboxylic acid, whose carboxylate groups can bind to the silica and bi-pyridinyl groups can covalently bond to the Ln ions. The authors speculate that the carboxylate groups most likely coordinate to the silica surface in a bridged or bi-dentate fashion, rather than a mono-dentate one. Various self-assembly techniques utilising polymers or polyelectrolytes (PE) have recently received considerable interest. Particles can be either stabilised or caused to fluocculate as a result of both electrostatic and steric effects originating from PE. The use of several charged layers to provide a coating around the nanoparticle core has been termed the layer-by-layer technique. The method has several advantages including the possibility of tuning the polymer-coating thickness and allowing deposition of a monolayer of charged particles or molecules. By employing this approach, Hong et al. have exploited the electrostatic interactions of PE with the negatively charged surface of magnetic nanoparticles followed by the addition of CdTe QDs to prepare the magnetic-fluorescent nanocomposites. The thickness of the polyelectrolyte coating can be tuned by successive additions of oppositely charged PE, e.g. poly(allylamine hydrochloride) and poly(sodium 4-styrenesulfonate) (Fig. 5). The presence of the polyelectrolyte was confirmed by zeta potential measurements, where the surface charge is found to change upon treatment with an oppositely charged species. Similarly, by alternate deposition and adsorption of charged polyelectrolyte interlayers and QD/polyelectrolyte multilayers, Fe3O4/PEn/CdTe and Fe3O4(PE3/CdTe)n core-shell nanocomposites were prepared . The fluorescence intensity of the composites was found to vary according to the distance between the magnetic core and QD layer. Kitagawa and co-workers  have prepared multi-functional magnetic particle by using polyelectrolyte multi-layers of cationic fluorescent and anionic polymers as the inner and outer layers, respectively, on the surface of the magnetic nanoparticles. Poly(ethyleneimine) (a cationic polyelectrolyte) was labelled with rhodamine B isothiocyanate and adsorbed onto carboxylate functionalised magnetic particles. The negatively charged polyelectrolyte DxS was then added to a suspension of the rhodamine-treated particles, producing a polyelectrolyte coating of several nanometres. 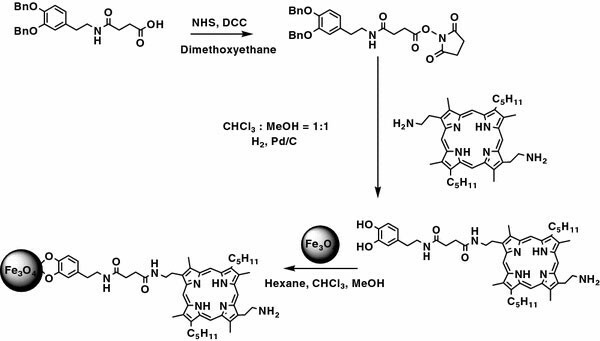 A rather different chemical approach via thiol coupling has been used by Rosenzweig and co-workers  in order to covalently attach CdSe/ZnS QDs to commercially available polymer-coated maghemite (γ-Fe2O3) beads. The QDs were capped with trioctylphosphineoxide (TOPO) and were soluble in chloroform. This presented a challenge, as the aim was to couple these QDs to water-soluble magnetic beads which had been treated with DMSA, providing free thiol and carboxyl residues for covalent attachment. In order to overcome this, the authors carried out the reaction in a 10:5:1 mixture of chloroform/methanol/water. By using an excess of QDs to magnetic beads (100:1), the reaction proceeded and the immobilisation was verified by an observed blue shift in the luminescence spectra of the QDs. A lower quantum yield of up to three times less than the original QDs in chloroform was noted. This decrease was attributed to quenching the interactions between the magnetic particles and the QDs or between the closely packed QDs. There have also been several reports of magnetic nanoparticles and QDs encapsulated within a polymer or silica matrix, allowing for the preparation of fluorescent entities which can be manipulated by an external magnetic field [34–36]. Electrostatic interactions have also been utilised in order to provide new fluorescent-magnetic nanocomposites. The interactions among the core nanoparticle, the spacer group and the fluorophore have been employed to prepare new fluorescent magnetite-porphyrin nanocomposites (Fig. 6) . In this case, a polyhedral silsesquioxane was synthesised, which could ionically interact with the negatively charged magnetic nanoparticles. A carboxylic acid porphyrin derivative was chosen, which could electrostatically interact with the positively charged amino spacer . Porphyrins are biocompatible fluorescent compounds which have been used as efficient photosensitisers for photodynamic therapy (PDT), a technique whereby tumour tissue is destroyed by the uptake of the dye and subsequent irradiation with visible light [39, 40]. By bringing together these entities, the resulting nanocomposites may find applications in hyperthermia and PDT, as well as providing a synthesis route to new drug delivery systems. Mėnager and co-workers  have used co-precipitated maghemite nanoparticles in conjunction with two different dyes—rhodamine B and a fluorescein derivative—to provide a new composite which enter live cells and resides in the cell endosomes. These authors present some interesting results including the observation of chain like assemblies of the endosomes due to the accumulation of the magnetic nanocomposites. In order to prepare these composites, the dye is first EDC coupled to dimercaptosuccinic acid (DMSA), which is itself positively charged and can interact strongly with the negatively charged nanoparticle surface. 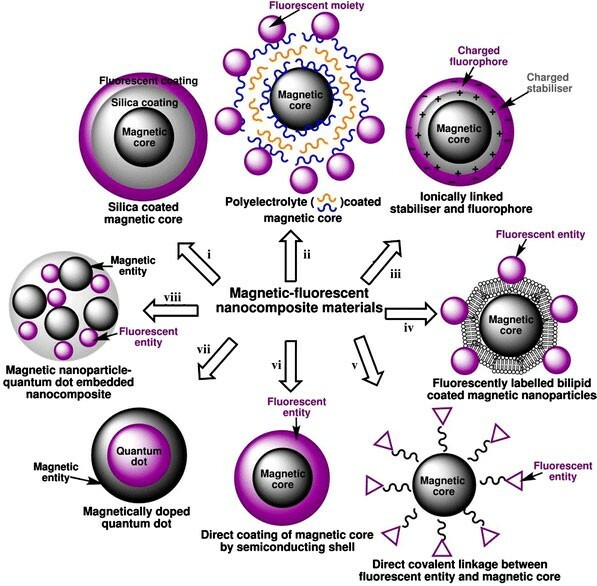 Hydrophilic, highly luminescent magnetic nanocomposites based on the connection of QDs and magnetic nanoparticles through charge interactions have been prepared by You et al. . In this work, positively charged magnetite nanoparticles and negatively charged TGA-capped QDs have been synthesised. In order to maintain these charges and improve the attachment of the QDs to the magnetic nanoparticles, the pH was adjusted to 3. This lower pH caused the QDs to flocculate and once the magnetic nanoparticles are added to a suspension of these QDs, they associate via strong electrostatic attractions. As noted previously , a decrease in luminescence intensity was attributed to dynamic or static quenching of the QDs. Lipid layers are frequently used to improve the stability and biocompatibility of nanoparticles. This technique is based on the coating of the nanoparticle surface by amphiphilic lipid molecules, which could then be linked to various species. There are several reports on the utilisation of this approach for the preparation of fluorescent-magnetic nanocomposites. In one of these works, magnetite nanoparticles coated with an oleate bilipid layer have been conjugated to biotin in order to bind streptavidin-fluorescein isothiocyanate . This receptor recognition-based synthesis allows for the preparation of magnetic-fluorescent nanocomposites, which have been studied using flow cytometry and fluorescence microscopy. A similar approach has been used by Zhang and co-workers  who have prepared a sandwich-type immunoassay by functionalising dextran-coated magnetic nanoparticles with a primary antibody via a Schiff base reaction and reacting them with CdTe QD-secondary antibody conjugates. A dual modality contrast agent, based on gadolinium-rhodamine nanoparticles, has been prepared by Vuu et al. . 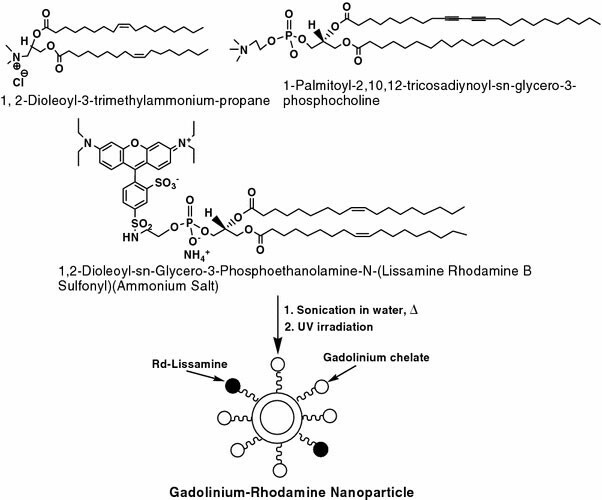 The 85-nm nanoparticles were prepared by mixing the gadolinium and rhodamine lipid monomers together with 1, 2-dioleoyl-3-trimethylammonium propane and 1-palmitoyl-2, 10, 12-tricosadiynoyl-sn-glycero-3-phosphocholine in darkness, followed by ultrasonic and UV treatment (Fig. 7). Two types of lipid-based magnetic contrast agents, one based on gadolinium and fluorescent entities combined in a bilipid layer and the second on a hydrophobic iron oxide nanoparticle in a fluorescent lipid-containing micellular shell, have been prepared by van Tilborg et al. . Amphiphiles with functional headgroups were chosen in order to allow the covalent coupling of annexin A5 proteins for targeting. In other works, these authors have further developed new liposomal Gd chelate-based fluorescent-magnetic nanocomposites [46, 47]. These nano-sized lyposomes consist of a commercially available Gd–DTPA complex attached to two stearyl chains, a fluorescent lipid, 1,2-distearoyl-sn-glycero-3-phosphocholine (DSPC), cholesterol and a 1,2-distearoyl-sn-glycero-3-phosphoethanolamine-N-[methoxy(polyethylene glycol)-2000 (PEG–DSPE) conjugate (Fig. 8). These nanocomposites can also be easily coupled to antibodies and other biomolecules enabling various biological applications. In another study, superparamagnetic iron oxide nanoparticles were encapsulated in a PEG-modified phospholipid micelle structure and have been conjugated to the fluorescent Texas red dye and the Tat peptide using N-succinimidyl 3-(2-pyridyldithio)propionate as a cross-linking reagent. This approach resulted in small, uniformly sized fluorescent-magnetic nanocomposites which are biocompatible, water soluble and stable . Taton and co-workers  have prepared “magnetomicelles” by coating hydrophobic magnetic nanoparticles with an amphiphilic polystyrene250-block-poly(acrylic acid13) block copolymer. These composites are water soluble due to the presence of the PAA outer block and by ensuring only 50% of the surfactant is cross-linked, further functionalisation is possible via attachment to the remaining carboxylic acid groups present. Bioconjugation was achieved by employing a technique called immobilised metal affinity chromatography. The protein loading capacity was determined by analysing the fluorescence spectra of particles conjugated to His-6 tagged enhanced green fluorescent protein (EGFP). The fluorescence intensity of the samples indicates that the EGFP remains intact after conjugation to the magnetomicelle surface. Direct linking of a fluorescent moiety to a magnetic core normally requires the use of a sufficiently long molecular linker in order to bypass any possible quenching by the paramagnetic core. The most common strategy is to use magnetic nanoparticles capped by a stabilising agent, which contains several functional groups available for further functionalisation. For example, citric acid capped magnetite nanoparticles have been covalently bound to fluorescent dyes, including Rhodamine 110, via carbodiimide coupling reaction. This process resulted in new nanocomposites suitable for further biological studies . In one study, Cheon and co-workers  prepared a monodisperse organic-stable suspension of 9 nm Fe3O4 nanoparticles which was phase transferred into aqueous solution via the addition of 2,3-DMSA. The DMSA acts not only to make the particles water soluble but also provides additional anchorage sites for the attachment of a fluorescent dye-labelled cancer-targeting antibody, in this case Herceptin. Porphyrin-coated magnetic nickel nanowires have been prepared by Tanase et al. by using ultrasonic effects to produce a covalent bond between the nickel oxide surface and the carboxylic acid groups of a porphyrin molecule. The main aim of this work was to assemble ordered arrays of nanowires with enhanced anisotropy. Porphyrin derivatives have also been employed by Gu et al. who have reported the preparation of porphyrin-functionalised magnetite nanoparticles using catechol chemistry to provide a covalent link between the magnetic cores and the fluorescent entity (Fig. 9). This involved the activation of a dopamine derivative withN-hydroxysuccinimide, followed by a reaction with diaminoporphyrin to form an ester bond. After a deprotection step to remove the benzyl groups of the dopamine, a direct linkage to the magnetite nanoparticle surface was achieved. There are several reports on nanocomposites where the magnetic core has been directly coated by II–VI semiconducting layers. In one, a CdS shell was deposited on the surface of FePt nanoparticles to form a fluorescent-magnetic core-shell nanostructure (Fig. 10) . This was achieved by a relatively simple one pot synthesis, which involved the following steps: (1) the thermolysis of Fe(CO)5 and the reduction of Pt(acac)2 by hexadecane-1,2 diol, resulting in FePt magnetic nanoparticles in dioctyl ether; (2) the deposition of a sulphur layer on the particles by the addition of elemental sulphur to the dioctyl ether solution at 100 °C; (3) the addition of TOPO, hexadecane-1,2-diol and Cd(acac)2 at 100 °C yielding a metastable core-shell FePt@CdS structure and finally (4) the transformation of the CdS layer from amorphous to crystalline by heating to 280 °C . The mismatch of the lattices of FePt and CdS and the surface tension force these core-shell nanoparticles to evolve into fluorescent superparamagnetic heterodimers consisting of CdS and FePt nanocrystals of <10 nm in size. Klimov and co-workers  reported the synthesis of Co/CdSe core-shell nanocomposites by controlled deposition of CdSe onto preformed Co nanocrystals. In this paper, Co nanoparticles were prepared by high-temperature decomposition of Co2(CO)8 in the presence of organic surfactant molecules. The CdSe precursors (CdMe2 and Se) in trioctylphosphine were then added to the Co nanoparticles at 140 °C and the mixture was kept at this temperature overnight. Subsequent heating up to 200 °C resulted in Co/CdSe core shell nanocomposites with an average diameter of 11 nm. This combination of magnetic nanoparticle and semiconducting QD demonstrated interesting magnetic and fluorescent behaviour. A similar approach was used by Shim and co-workers  to prepare a series of maghemite—metal sulphide (ZnS, CdS and HgS) hetero-nanostructures. These nanocomposites have been prepared by direct addition of sulphur and the appropriate metallorganic precursors to preformed γ-Fe2O3 nanoparticles, followed by high-temperature treatment. Similar to the above heterodimers, the large lattice mismatch between γ-Fe2O3 and metal sulphide nanocrystals resulted in the formation of non-centrosymmetric nanostructures. Preferential formation of trimers and higher oligomers was observed for ZnS and dimers or isolated particles for CdS and HgS nanocomposites. However, the fluorescent and magnetic properties of these nanocomposites have not yet been investigated. In another report, magnetite nanoparticles prepared via a high-temperature decomposition method have been coated with CdSe followed by deposition of a layer of ZnS by Du et al. . The quantum yield was measured against a rhodamine B standard and was found to increase from 2–3 to 10–15% upon addition of the ZnS shell. This increase is owing to the decrease in the number of defects in the Fe3O4/CdSe shell. Magnetisation measurements showed no coercivity or remanence at 2 K, indicating the presence of paramagnetic material. Water dispersible, multi-functional CdS:Mn/ZnS magnetically doped QDs have been prepared using a water-in-oil microemulsion method . Using this approach, manganese doped QDs have been fabricated by mixing sodium sulphide with cadmium and manganese(II) acetates in dioctyl sulfosuccinate, heptane and water in the appropriate ratio. A zinc salt was then added to grow a uniform ZnS shell. A bright yellow emission is observed due to surface passivation by the epitaxially matched ZnS crystalline layer around the CdS:Mn crystalline core. These materials have demonstrated fluorescent, radio-opaque and paramagnetic properties and can be further functionalised with biomolecules such as DNA, proteins, peptides or antibodies. More recently, these authors have reported the functionalisation of these magnetically doped QDs with Gd(III) ions for applications in MR contrast imaging . The silica-coated CdS:Mn/ZnS QDs were treated with the chelating silane coupling agent triacetic acid trisodium salt, allowing subsequent coordination of Gd(III) ions. Multi-functional nanomaterials possessing fluorescent and magnetic properties may be used in a number of biomedical applications in nanobiotechnology, such as bioimaging, bio- and chemo-sensing, cell tracking and sorting, bioseparation, drug delivery and therapy systems in nanomedicine. Fluorescence microscopy and nuclear MRI are two main imaging techniques which have had a tremendous impact upon biomedical science in recent years. Unlike previous approaches which may have required the processing of fixed tissue samples, these techniques allow for the imaging of live and intact organisms both in vivo and in vitro, resulting in a more realistic picture of the processes occurring in live biological species. Frequently, these imaging techniques are complimentary to each other and could be used for parallel detection to have a clearer picture and provide a correct diagnosis. In this case, fluorescent-magnetic nanocomposites serve as new dual function contrast agents, which can be used simultaneously in confocal fluorescent microscopy and in MRI. In addition, fluorescent-magnetic nanocomposites allow us to perform optical tracking of biological entities and processes in combination with magnetophoretic manipulation. There are several reports on the utilisation of multi-functional fluorescent-magnetic nanocomposites as contrast agents. These multi-functional materials are of particular importance as probes and biological labels for cellular imaging. Intracellular uptake and imaging using magnetic fluorescent nanoparticles prepared by Mėnager and co-workers  have shown that, after cellular uptake, these nanoparticles were confined inside endosomes which are submicrometric vesicles of the endocytotic pathway. The authors have shown the possibility of magnetic manipulation of these internalised nanocomposites, resulting in the formation of spectacular fluorescent chains aligned in the direction of the applied magnetic field (Fig. 11). In another study, biocompatible PEG-modified, phospholipid-coated iron oxide nanoparticles have been conjugated to a fluorescent dye and the Tat-peptide and used for the imaging of primary human dermal fibroblast cells and Madin–Darby bovine kidney derived cells. These micelle-coated iron oxide nanocomposites demonstrate great potential for conjugation of a variety of moieties for specific intracellular and tissue imaging . The rhodamine-labelled citric acid capped magnetite nanoparticles have been used as fluorescent biological markers. Confocal fluorescence microscopy demonstrated that these nanocomposites respond to an applied magnetic field and are taken up by KB cells in vitro. These materials can serve as biocompatible fluorescent ferrofluids, which enable optical tracking of processes at the cellular level combined with magnetophoretic manipulation . Strong luminescence and high relaxivity at low field were demonstrated by a new type of “two-in-one” fluorescent-magnetic nanocomposites based on magnetite nanoparticles, a polyhedral octaaminopropylsilsesquioxane and a porphyrin derivative confocal imaging found that the incubation of macrophage and bone osteoblast cells at the presence of these nanocomposites resulted in their fast intercellular localisation. The nanocomposites also exhibited a distinctive subcellular distribution corresponding to the location of the mitochondria, endoplasmic reticulum and nuclei (Fig. 12). 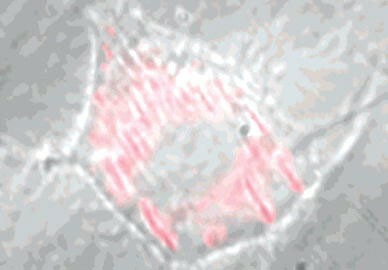 It was suggested that there is a dissociation of the ionic components of the magnetic-fluorescent nanocomposites inside cells resulting in release of porphyrin species, which can penetrate various intracellular compartments. Such intracellular fragmentation of the nanocomposites allows potential utilisation of these new nanocomposites both as subcellular imaging contrast agents and targeted drug delivery systems . One of the important areas in which fluorescent magnetic nanoparticles have demonstrated great potential is in cancer cell and tumour imaging. It has been shown recently that human prostate, rodent prostate, human breast and mouse mammary cancer cell lines can be readily labelled by fluorescent superparamagnetic particles composed of divinyl benzene polymer containing magnetite nanoparticles and a fluorescein-5-isothiocyanate analogue within a polymer matrix. Fluorescence stereomicroscopy and three-dimensional MRI allowed in vivo imaging of intramuscular or orthotopically implanted-labelled cancer cells. 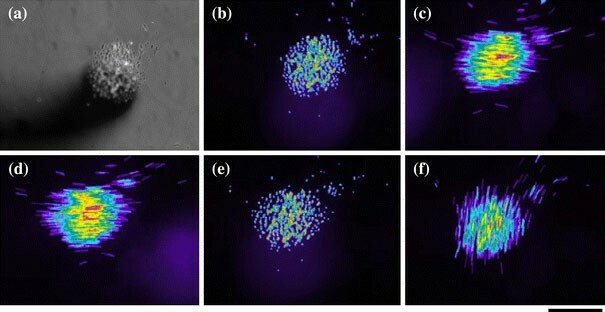 These fluorescent superparamagnetic particles were inert with respect to cell proliferation and tumour formation and served as both a negative contrast agent for in vivo MRI, as well as a fluorescent tumour marker for optical imaging in vivo and in vitro . Gd-based bimodal targeted liposomal contrast agents for the detection of molecular markers, using both MRI and fluorescence microscopy, have been introduced by Mulder and co-workers [45–47]. Conjugates of these contrast agents with E-selectin-specific antibodies were tested on human endothelial cells stimulated with tumour necrosis factor. These conjugates have been shown to be excellent contrast agents for both fluorescence microscopy at the subcellular level and for MRI on cell pellets. A series of dual near-infrared fluorescent-magnetic probes (CLIO-Cy5.5) based on a superparamagnetic iron oxide core coated with cross-linked dextran to which the fluorochrome Cy5.5 is covalently attached have been developed by researchers in Harvard Medical School [16, 61]. These nano-sized conjugates have been used for MRI and optical imaging of various tumours in animal models. This research has demonstrated that the utilisation of these dual contrast agents and combination of two imaging techniques (MRI and fluorescent optical imaging) allowed for more accurate localisation and delineation of tumour margins, an important consideration for surgical resection of tumours (Fig. 13) [61–64]. Conjugation of iron oxide particles with fluorescent dye-labelled antibodies resulted in multi-functional magnetic nanocomposites, which performed both in vitro and ex vivo optical detection of cancer as well as in vivo MRI, which are potentially applicable for an advanced multi-modal detection system . Recently, it was reported that biotin-conjugated superparamagnetic Fe3O4 nanoparticles have been functionalised by binding the fluorescent tag streptavidin-fluorescein isothiocyanate (FITC) and, following uptake into HeLa cells, shown to confer magnetic activity and fluorescence labelling. It was found that these nanocomposites were localised in the lysosomal compartment of cells indicating a receptor-mediated uptake mechanism . It has also been reported that cobalt ferrite nanoparticles coated with a silica shell containing organic dye (FITC) and an antibody (Ab CD-10) can be specifically taken up by leukaemia cells and A549 lung cancer cells. This enabled selective fluorescent labelling, imaging and potentially sorting of the cells opening new prospects in cancer diagnostics and therapy . Ultimately fluorescent magnetic nanoparticles show great potential for imaging of brain-derived structures. For example, fluorescent superparamagnetic iron oxide nanoparticles coated with functionalised polyvinyl alcohol have been derivatised with a fluorescent reporter molecule and administered to a microglial cell culture, containing immune cells of the nervous system. These nanocomposites demonstrated good biocompatibility and strong intracellular uptake. Hence, they have been envisaged as potential vector systems for drug delivery to the brain, which may be combined with MRI detection of active lesions in neurodegenerative diseases . In another report, TAT (a cell penetrating peptide)-conjugated CdS:Mn/ZnS magnetic QDs have been used to label and visualise brain tissue without manipulating the blood–brain-barrier. The fluorescent visualisation of the whole rat brain was achieved using a simple low power handheld UV lamp . The bioimaging techniques described above play an important role in cytometry and cell tracking. In 1999, Terstappen and co-workers  reported a new approach for optical tracking and detection of immunomagnetically selected and aligned cells. In this work, blood cells were labelled with magnetic nanoparticles and fluorescent probes and aligned along ferromagnetic lines deposited by lithographic techniques on an optically transparent surface of a chamber under a magnetic field (Fig. 14). An epiillumination system, using a 635-nm laser diode, scanned the lines and measured signals obtained from the aligned cells giving the cell counts per unit of blood volume. This cell analysis method was found to be significantly less complex and more sensitive than conventional cell analysis. In addition, this method allows for repeated and varied analyses to be carried out on the cells while they remain in a natural environment (i.e. whole blood). Development of two in one fluorescent magnetic nanoparticles would be greatly beneficial for further development of this technique. In fact, dual fluorescent magnetic nanocomposites have demonstrated their great potential for cytometry and cell sorting. A magneto/optical annexin nanocomposite has recently been developed by reacting an amino-CLIO magnetic nanoparticle with Cy5.5 and SPDP, to produce fluorescent/magnetic, sulfhydryl reactive nanohybrids. These nanocomposites demonstrate good binding activity for apoptotic cells, while being detectable by both fluorescent and MRI modalities. 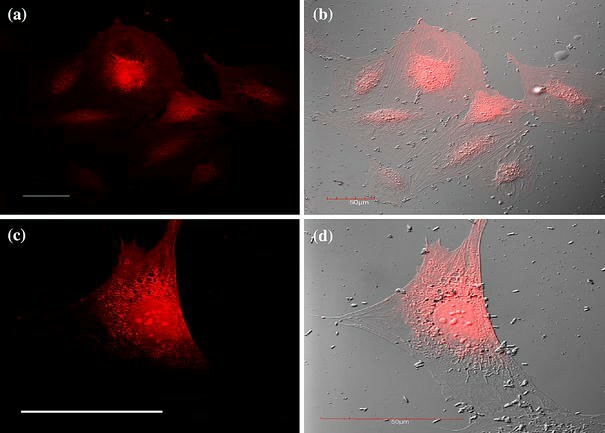 These multi-modal annexin composites can be used with cell-based fluorescence methods to select, separate and apoptotic cells using an external magnetic field . It was also reported that the detection of apoptotic cells can be achieved by using lipid-based fluorescent-magnetic nanocomposites covalently coupled to human recombinant annexin A5 molecules. 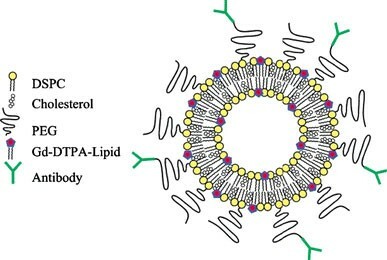 These composites consisted either of iron oxide particles encapsulated within PEGylated micelles or gadolinium chelate-based lipids trapped within the lipid bilayer of PEGylated liposomes. The in vivo detection and visualisation of apoptosis could enable early detection of therapy efficiency and evaluation of disease progression . Visual sorting and manipulation of apoptotic cells using fluorescent-magnetic multi-functional nanospheres was also reported by Pang and co-workers . These fluorescent-magnetic nanospheres were formed by co-embedding QDs and magnetite nanoparticles into hydrazide-functionalised copolymer nanospheres, which were then covalently coupled on the surface with IgG, avidin and biotin to generate fluorescent-magnetic bio-targeting trifunctional nanospheres. These nano-bio-composites can selectively link to apoptotic cells, allowing their visualisation and isolation . Similar types of fluorescent-magnetic nanocomposites have also been used by the same group to capture, visualise and magnetically separate various specific cancer cells . The functionalisation of nanocomposites, consisting of a polymer-coated maghemite superparamagnetic core and a CdSe/ZnS QD shell, with anticycline E antibodies, has permitted the separation of MCF-7 breast cancer cells from serum solutions. The surface immobilised anticycline E antibodies bound specifically to cyclin, a protein which is expressed on the surface of breast cancer cells. The separated cells were monitored by fluorescence imaging microscopy, due to the strong luminescence of these nanocomposite particles . An interesting external “magnetic motor effect” on floating cells, treated with fluorescent-magnetic nanocomposites, has been reported by Lee and co-workers . They used rhodamine B isothiocyanate-labelled cobalt ferrite–silica magnetic nanoparticles, which have been modified with PEG groups and administered these nanocomposites to a breast cancer cell culture. It was found that these nanocomposites were delivered to the cytoplasm of living cells, allowing both fluorescent and magnetic labelling of the cells. In addition, it was demonstrated by microscopy that moving the position of an applied external magnet results in a fast change in the direction of the cells containing magnetic nanoparticles (a so-called “magnetic motor effect”). This research shows the great potential for magnetic-fluorescent nanocomposites as reagents for cell labelling, bioseparation and related applications. Fluorescent-magnetic nanocomposites can be used to isolate not only cells but also various biomolecules and other biological entities, allowing simultaneous control over the process using fluorescent microscopy. This is a major advantage over conventional magnetic separation techniques. For example, the detection and extraction of antibodies from aqueous solutions, using fluorescent magnetoliposomes, has been reported by Rosenzweig and co-workers . The fluorescent magnetoliposomes consist of cobalt platinum alloy nanoparticles encapsulated in liposomes, which have been labelled with BODIPY-Fluorescein dye. The monitoring of the extraction by measuring the fluorescence intensity allows determination of the maximum extraction time. Magnetic/fluorescent nanocomposites offer unique opportunities for bio- and chemo-sensing. The dual properties of these composites allow not only a detection of certain entities using both magnetic resonance and fluorescence techniques but also enable them to be utilised as a type of magnetic tweezers for positioning and manipulation of the sensor in three dimensions. This is particularly important for chemical and biological sensing in cellular environments. The pH sensitivity of magnetic nanospheres based on iron oxide nanoparticles encapsulated within hollow organically modified silica particles nanospheres that have been filled with a pH sensitive dye [(9-(diethylamino)-5-[(2 octyldecyl)imino]benzoa phenoxazine)] has been recently reported . Swarms of these nanocomposites were magnetically guided through a pH gradient, while measuring their fluorescence spectral emission. The magnetic tweezers allowed control over the size and position of the swarm magnetically, without direct mechanical contact (Fig. 15). In addition, the tweezers can reversibly assemble the particles within the swarm into chains and control the orientations of these chains. These new materials demonstrate a unique ability for chemical sensing, while providing options to simultaneously modulate fluorescence intensity, produce singlet oxygen, apply mechanical forces and even measure chemical and physical properties of fluids and surfaces. The use of functionalised magnetic particles for selective binding to low-abundance target analytes and pre-concentrating them, allowing for the removal of the sample matrix prior to the detection step, is quite a popular strategy for DNA or virus sensing [74–77]. The utilisation of magnetic nanoparticles for magnetically confining and concentrating target analytes in a microscopic volume for in situ optical detection significantly improves the selectivity and sensitivity of DNA sensors. Normally, this approaches involves a “capture and release” system, in which the target DNA is captured by functionalised magnetic particles, separated from the sample matrix and then released in a suitable aqueous medium prior to detection with the polymer-probe duplex. Boudreau and co-workers  have developed new modified method which eliminates the release and labelling of the hybridised target DNA, prior to optical detection, by using a fluorescent polymeric hybridisation transducer supported on magnetic beads. This approach allows for both the pre-concentration and detection steps to occur simultaneously on the same support, resulting in rapid, ultrasensitive and sequence-specific detection of DNA. The combination of the fluorescent polymer biosensor with the magnetic particle-assisted DNA pre-concentration could enable the application of this sensoring technique to biological samples with complex matrixes and to integrated lab-on-a-chip platforms for fast multi-target DNA detection. The term “nanoclinics” was initially introduced by Prasad and co-workers , when their report on hierarchically built nanoparticles for targeted diagnostics and therapy appeared in 2002. These nanocomposites consist of a thin functionalised silica shell encapsulating magnetic (Fe2O3) nanoparticles and two-photon fluorescent dyes. The silica surface of these core-shell structures was functionalised with aluteinising hormone-releasing hormone for specific targeting of cancer cells. These nanocomposites have potential applications as MRI contrast agents, optical imaging diagnostic tools and as magnetic-induced cancer therapy devices. Xu et al. 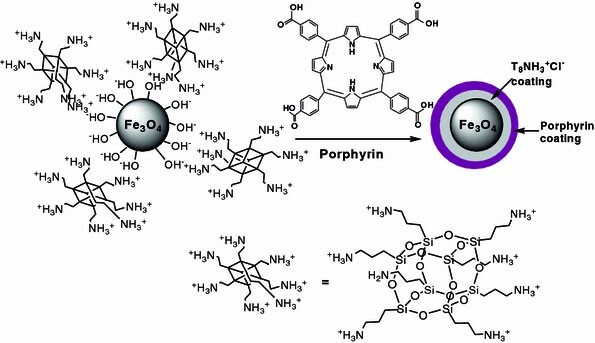 have reported porphyrin—iron oxide nanoparticles conjugates, which can be utilised as bimodal anticancer agents for combined PDT and hyperthermia therapy. These conjugates can be effectively taken up by cancer HeLa cancer cells. The exposure of the cells containing the nanocomposites to yellow light resulted in a significant change of their morphology due to the cell apoptosis. These results demonstrate a potential of these nanoparticles for cancer therapy. An interesting experiment was performed using magnetic-fluorescent polymer capsules, which were simultaneously functionalised with magnetic nanoparticles and fluorescent CdTe nanocrystals. These nanocomposites have been used for modelling the bloodstream in a flow channel system under a magnetic field gradient, which allowed for the specific trapping of polymer capsules. In the regions where the capsules were trapped by the magnetic field, an increased uptake of the capsules by breast cancer cells was observed due to the high local concentration of the composites. The process was monitored by fluorescence microscopy. These results demonstrate the potential use the multi-modal fluorescent-magnetic polymer capsules loaded with pharmaceutical agents for targeted drug delivery and cancer therapy . Veiseh et al. have prepared magnetite nanoparticles with a polyethylene glycol coating and have subsequently functionalised these with chlorotoxin (Cltx), a glioma tumour-targeting molecule and the fluorescent molecule Cy5.5. They have shown that the nanoparticle-Cltx conjugates target glioma tumour cells and that this internalisation into the cells can be visualised by confocal imaging. The reported T2 relaxation times (5 ms for the Cltx coated particles, 95 ms without) are promising for glioma detection. They have also demonstrated an affinity of these nanocomposites for glioma cells over healthy tissues. Targeted cancer imaging has been investigated by Choi et al. using folate-treated magnetic nanoparticles. The folate receptor is a protein which is over-expressed in various types of human tumours, where it acts to capture folate to feed rapidly dividing tumour cells. The idea here was to use dextran-coated magnetic nanoparticles which were tethered to folic acid and a fluorescent imaging agent (fluorescein thioisocyanate). In this way, once the particles were internalised into the cancer cells, it was possible to obtain and analyse a tumour image in vivo. The resulting T2-weighted MR images reveal a 38% decrease in the intensity of the tumour tissue owing to the presence of the folate-coated nanoparticles (Fig. 16a, b). Internalisation was also confirmed using confocal imaging of human carcinoma cells which express the surface receptors for folic acid (Fig. 16c). In this review, we have shown that many fluorescent-magnetic nanocomposites of different varieties have been developed over recent years. There is a great need and demand for these materials. From above discussion, it is clear that magnetic-fluorescent nanocomposites offer new approaches and opportunities in chemistry, biology and medicine. However, despite of all recent progress made, the fluorescent-magnetic nanocomposite area is still in its infant stage and significant efforts are needed for further development of these materials and their utilisation. We believe that in the long-term new fluorescent-magnetic nanomaterials could serve as all in one diagnostic, surgery and nano-sized drug delivery tools, which could help in the diagnosis and treatment of cancer, HIV and many other diseases. Because of their small size and combination of magnetic and fluorescent properties, these nanocomposites open up the unique possibility of controlled target-directed applications. This is of particularly great importance in medicine, as one major disadvantage of any nanoparticle therapy is the problem of getting the particle to the site of interest. An external magnetic field could be used to attract the multi-modal fluorescent-magnetic nanocomposites to the desired area, to hold them there until the diagnostic or treatment is complete and finally to remove them. All steps can be monitored by MRI and florescence microscopy allowing the full control over the processes. Thus, further development and utilisation of magnetic-fluorescent nanoprobes could revolutionise many aspects of modern medicine. However, toxicity is of major concern when advocating nanoparticles for any biomedical use. Unfortunately toxicity of nanomaterials is still very poorly studied and understood. There is a recent report on the reduced toxicity for the gelatine-coated CdTe QD nanocomposites and their potential as bioimaging agents . We believe similar approaches can be used for the development of certain fluorescent-magnetic nanocomposites with low toxicity. A significant part of the future work in this area must be focused on the investigation of the toxicity and improvement of biocompatibility of multi-modal nanocomposites. This will be crucial for further development of this very important field of nano-biotechnology.